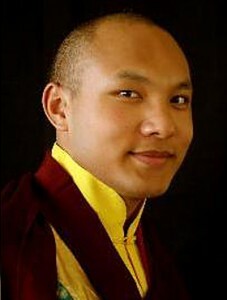 After his mother had wonderful dreams during her pregnancy, His Holiness the 17th Karmapa was born into a nomad family in the Lhatok region of Eastern Tibet in 1985. On the day of his birth, a cuckoo landed on the tent in which he was born, and a mysterious conch-like sound was heard by many throughout the valley. In Tibet, such events are considered auspicious portents of the birth of an enlightened teacher. The young nomad, named Apo Gaga, lived a life that seemed, to his family, full of blessing, but Apo Gaga did not reveal to them who he was. However, in 1992, he asked them to move the location of their nomadic home to another valley, and told them to expect a visit from His Holiness the 17th Gyalwang Karmapa. 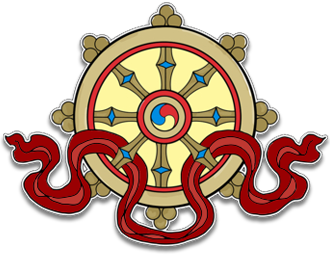 Soon after setting up their home in the new location, followers of the Sixteenth Karmapa came to that valley pursuant to the secret instructions of the Sixteenth contained in his letter of prediction. The birth and the other details of Apo Gaga’s life matched the predictions of the letter. Apo Gaga was discovered to be the Seventeenth Karmapa, Ogyen Drodul Trinley Dorje. The Seventeenth Karmapa did in fact return to Tolung Tsurphu Monastery in Central Tibet in 1992, where he was enthroned on September 27, 1992, with the permission of the Chinese government, a first in Tibet. Over 20,000 supplicants assembled. The following morning, some 25,000 people filed before His Holiness to receive a personal blessing. At Tsurphu, the Karmapa studied the Buddhist sciences of mind, learned ritual, and practiced sacred arts, such as dance. Each day he received hundreds of visitors from throughout Tibet and around the world. He eventually began to offer empowerments and participated in various rituals at the monastery. At the age of about 10, His Holiness recognized the rebirth of reincarnate teachers, including such eminent teachers as Pawo Rinpoche, Jamgon Kongtrul Rinpoche and the young Dabzang Rinpoche. While His Holiness was at Tsurphu, the monastery underwent extensive rebuilding to restore the temples, shrines, stupas, a shedra, and residences that had been destroyed over the years, fulfilling one of the main duties of a Karmapa. As the years went by, however, His Holiness came under increasing pressure from Tibetan and Chinese authorities to act in ways which were contrary to his obligations as a Karmapa. He publically refused to denounce the Dalai Lama and to recognize the Panchen Lama, and engaged in numerous other acts which were contrary to the wishes of the authorities. Finally, in 1999, recognizing perhaps that his usefulness in Tibet was being undermined, he decided to leave. Though he was under constant surveillance from the Chinese government, who refused to let him leave the country, he and a handful of attendants concocted a bold scheme to escape. After months of careful planning, on December 28, the fourteen-year-old Karmapa pretended to enter into a solitary retreat, and instead, donned civilian garb and slipped out a window. Leaving Tsurphu Monastery with a handful of attendants, he began a daring escape by car, foot, horseback, helicopter, train and taxi, a heroic journey which was to become the stuff of headlines throughout the world. On January 5, 2000 he arrived, to the the great surprise and overwhelming joy of the world, in Dharamsala, India, where he was met by His Holiness the Fourteenth Dalai Lama. He received refugee status from the government of India in 2001. His Holiness continues to live near Dharamsala, awaiting permission from the Indian authorities to leave Dharamsala and return to Rumtek Monastery, the traditional seat of the Karmapas in India. Detailed biographical information about His Holiness the 17th Karmapa is available on the official Kagyu Office website.